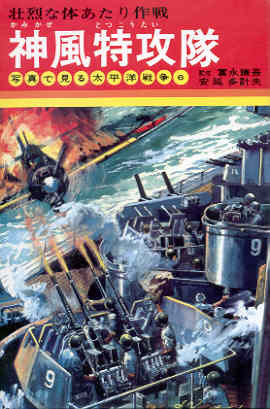 The eight-volume series Taiheiyō sensō miru de shashin (Pacific War seen through photographs) covers a different topic in each book, such as the Pearl Harbor Attack in Volume 1, Aircraft Carriers in Volume 4, and B-29 Bombers in Volume 8. Although this series targets junior high school students as its primary audience, Volume 6 on Kamikaze Tokkōtai (Kamikaze Special Attack Corps) provides a valuable source to any age due to its thorough research, excellent organization, many historical photos, and helpful illustrations and charts. This book, published originally in 1972, has remained popular with 14 printings through 1995. The kanji (Chinese characters) in the book have their pronunciation displayed for junior high students, but the author writes as if directing his words at adults. The unselfish and noble spirit of these Kamikaze Special Attack Corps members in defense of their country so that we Japanese people could survive must be steadfastly preserved in the hearts of our people. If the day arrives when the Japanese people forget this spirit, that is if the day comes when we lose the spirit and patriotism to defend the country by giving our own lives, then the day of the Japanese people's downfall can be declared. Even though the Kamikaze Special Attack Corps members fought giving their own lives and accomplished considerable battle results, in the end they were not able to realize their earnest desire. Although they lost in the fighting, the Kamikaze Special Attack Corps were the flowers of the Pacific War. What the Kamikaze Special Attack Corps brought forth was the pride of the Japanese people. The tokkō (special attack) spirit is the true way of the warrior and is similar to Buddha's spirit of great compassion and mercy and God's great love. If said in this way, I think some will immediately strike back by saying "nonsense" or "unbelievable," but the author thinks so and believes in this way. Although Yasunobu tends to emphasize the successes of Japanese kamikaze attacks, he also recognizes the bravery of men in the American Navy. For example, he uses several pages to tell the story of how the destroyer Laffey shot down several incoming planes and survived multiple hits by kamikaze aircraft. He relates the incident (p. 140) of an officer asking Captain F. Julian Becton after the ship had been hit several times, "Do you think we'll have to abandon ship?" Becton replied, "I'll never abandon ship as long as a gun will fire!" The book's four parts cover chronologically the history of the Kamikaze Special Attack Corps. Part 1 provides background and describes the military beliefs that led to the formation of the kamikaze squadrons. The Japanese military believed in no surrender until death, which gave rise to several instances of taiatari (body-crashing) attacks by Japanese Navy pilots on American ships even before the official formation of the Kamikaze Special Attack Corps in October 1944. Part 2 describes the formation of the first kamikaze squadrons by Vice Admiral Ohnishi and summarizes the kamikaze operations in the Philippines from October 1944 to January 1945. Part 3 covers kamikaze attacks during the Battle of Iwo Jima and the long-distance attack on Ulithi by 24 Ginga bombers on March 11, 1945. Part 4 gives an account of the mass kamikaze attacks just before and during the Battle of Okinawa from April 1 to June 23, 1945. This history has several special features that make it one of the best introductions in Japanese to the Kamikaze Special Attack Corps. The book has numerous illustrations such as different attack methods, squadron formations for kamikaze attacks, and bombs carried by kamikaze aircraft. Various maps show the location of kamikaze bases and attacks in the Philippines, Taiwan, Iwo Jima, Ulithi, and Okinawa. The historical photos provide a good mix of the Japanese side with kamikaze planes and squadrons and the American side with ships hit by kamikaze aircraft. 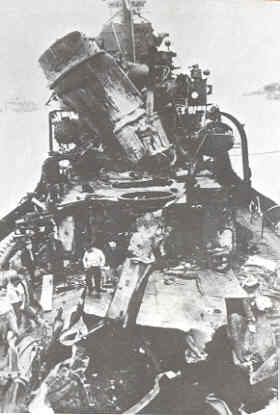 Some photos do not have specific identification, but this also occurs frequently in other books about kamikaze. The final chapter includes comparative summary statistics on success rates of Navy and Army kamikaze attacks in the Philippines and Okinawa. There is also a table that gives total numbers of different types of ships sunk and damaged by kamikaze aircraft. The end of the book has a four-page chronology of key events during the Pacific War. Both individual stories and general history receive attention throughout the book. These personal stories from the Japanese side make the history come alive. For example, the author includes the letter from Ensign Masahisa Uemura to his only daughter Motoko, and he describes the emotional scene in March 1972 when she performed a traditional Japanese dance at Tokyo's Yasukuni Jinja, the national shrine for Japan's war dead, in front of an audience that included her mother and her father's friends from the war. In another personal story, Vice Admiral Matome Ugaki, commander of the Fifth Air Fleet and leader of Japan's kamikaze attacks during the Battle of Okinawa, decided to carry out a final kamikaze attack after hearing that Japan had surrendered. He wrote in his diary, "I'm going to follow in the footsteps of those many loyal officers and men who devoted themselves to the country, and I want to live in the noble spirit of the special attack." Although not unbiased due to long service in the Japanese Naval Air Corps, Takeo Yasunobu presents a thorough history of the Kamikaze Special Attack Corps with many fascinating insights based on his experience.